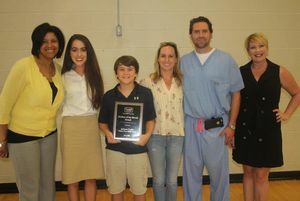 (By Susannah Marley • Staff Writer/ Williamson Herald Click HERE for full article) Poplar Grove Middle School student Jackson Cooke has been honored as the Goodall Homes Student of the Month for June. Nominated by his teacher Laura Lavery, Jackson’s favorite subject is science as he hopes to one day become a surgeon. “Jackson is very intrinsically motivated at such a young age,” Lavery said. “His peers look up to him as a role model and his positive behavior is shown every day.” “I’m very excited to honor Jackson with this award,” Goodall Homes Director of Marketing Rachael Overall said. “Each month what we do is recognize an outstanding student in Williamson County who has gone above and beyond the call of duty to give back to their peers, community and family and overall represent good character. Not only is Jackson a positive role model and star student, he is also a budding entrepreneur. In his old neighborhood, he and his friends began a business called the Neighborhood Garbage Guys. For a small fee, they would take peoples’ garbage containers from their house to the road for trash day, then deliver the containers back to the customer’s house. “ had about 20 customers,” Jackson’s father said. “They would do their jobs in the rain, sleet or snow.” Jackson also plays tennis, loves music and teaches 3-year-olds’ Bible class at church. To nominate a Williamson County student, find a Goodall Homes Student of the Month form under the home menu online at www.williamsonherald.com.